Flag Football Season is Back! Flag Football season is back! This popular league is designed for kids who love football and the fast- paced action of the game in a safe fundamental based environment. No tackling, no pads, and lots of fun! 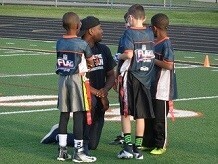 Kids are placed on balanced teams following an initial evaluation, and we utilize volunteer parents to coach teams. While play is on Saturday, coaches may hold additional practices during the week. Evaluation date for all players is Saturday, August 25. Play begins September 8. Participants should wear loose clothing and football cleats and bring a water bottle. Resident: $89 / Nonresident: $99. To register, call (216) 831-8601 today.